While my longer term opinion is quite bearish Corn, Wheat and Soybeans, hot, dry weather has shown up in the Midwest exactly when Corn and Soybeans are quite vulnerable as they enter their final stages of development. 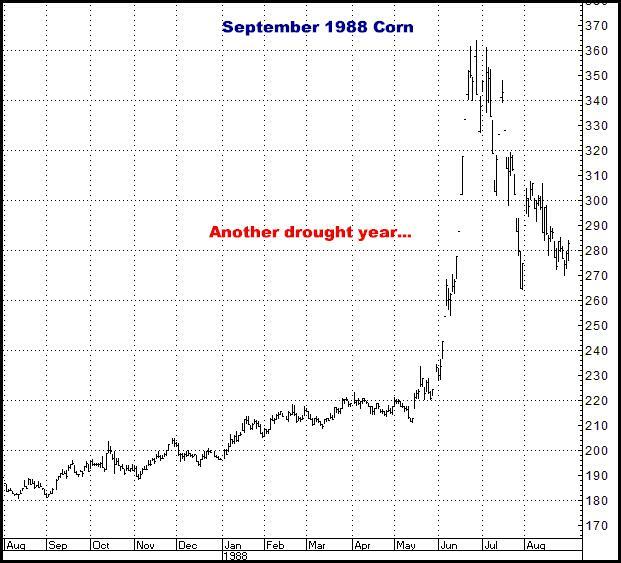 Consequently, with all three markets sharply higher today, seemingly led by Soybeans, we appear to perhaps be in the early stages of a full blown “weather market”. As I have written, almost annually, for many years, probably the biggest, fastest animal we ever have in futures is a weather event in the Midwest…and when one does come along, I long ago learned you do NOT sit there and dogmatically declare, “I’m still bearish!”. 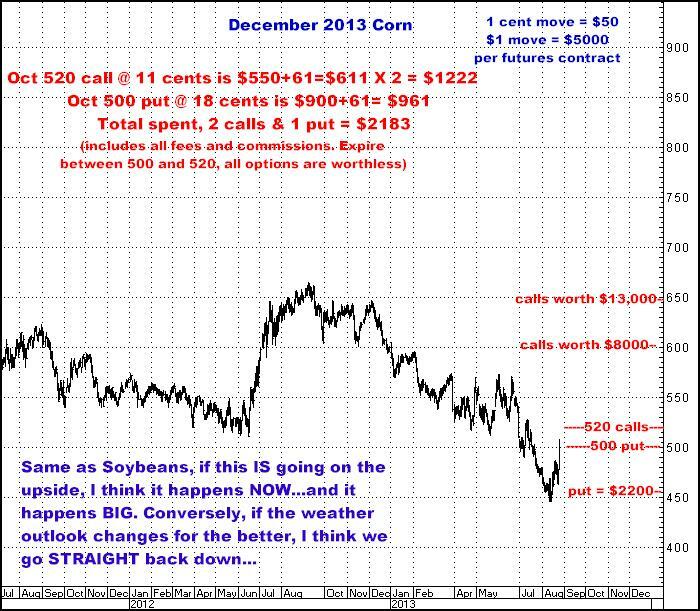 Weather is the one factor that can literally, on almost an overnight basis, dramatically change the balance between supply and demand in any agricultural market…which generally leads to SHARPLY higher prices…so when such an event does appear, experience has taught me, what you are “supposed” to do is JUST GET ON IT. Define your risk, however you do it, and just Buy the Market…At the Market…You do not wait for the perfect moment. You do not wait for the hoped for pullback. You do not “wait and see what happens”. For my money, you are either “in”, or not, and taking your chances. You will then either have a shot at possibly winning big…or you will lose, as dictated by whatever means you use to define your risk. 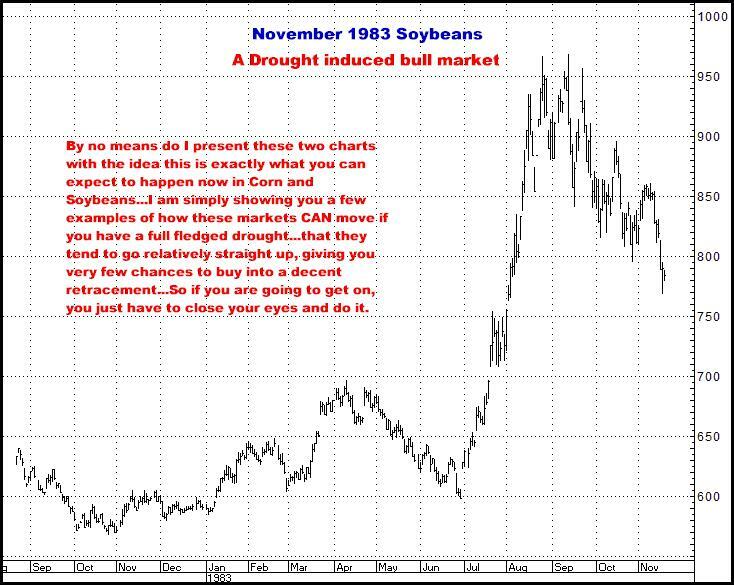 As noted on the Soybean chart, I am NOT saying that what happened in those two droughts (and again in 2012) is absolutely going to happen right now. The fact is, on any given day, the weather forecasting “models” could change completely, from “hot and dry” to “nicely sunny and just enough rain”, and Corn and Beans would probably then go straight back down, maybe even faster than they have recently come up…So there is no way to know…but what you do need to understand is, dry weather and the grains CAN mean STRAIGHT UP...and they can do so just about as fast and big as anything that ever happens in this business. I started buying both Corn and Soybeans this morning (AFTER their higher openings) and will continue to do so. I am using the basic strategies shown below. I have no targets in mind. 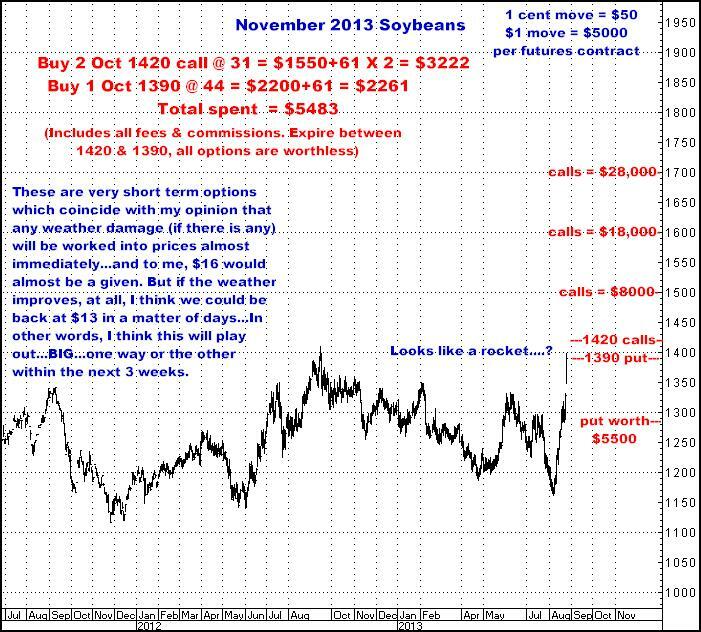 However, I do enter these trades with the idea Soybeans could easily trade up $2, $3 or $4 a bushel, and Corn up $1 to $2, all dependent on exactly how the weather does play out, and beyond that, how “unexactly” and to what extreme, the mob psychology of this giant GAME “decides” to take prices in these two markets. I would also note that regardless of what now happens on the upside (or doesn’t), I see this as a very temporary situation. 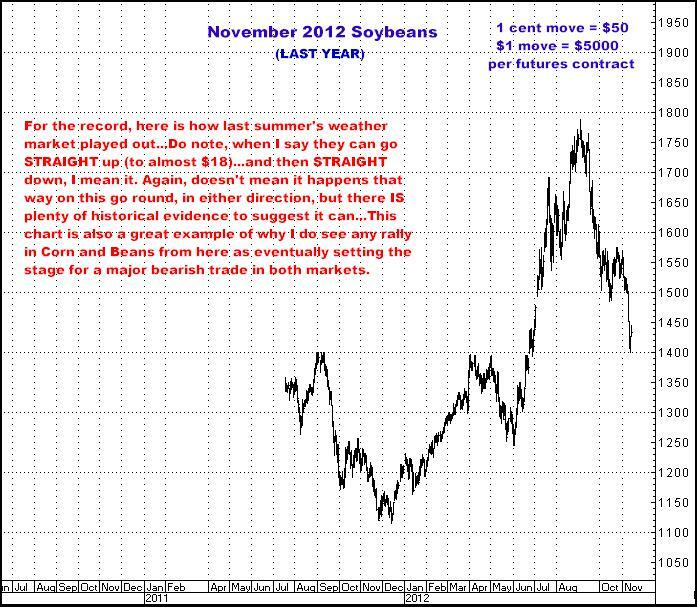 If these markets are going up due to weather, I firmly believe the bull moves will be more or less “done” within the next 2 to 6 weeks…however big they are…and then both Corn and Soybeans, and Wheat as well, will all be in place to begin major bear markets extending out to late next summer. So…I say these markets are set to either Fly…or Die…or eventually do both…and although I do think the big picture is decidedly bearish, I currently think it makes sense to assume something truly big may be happening on the up side…BUT…whatever you do here, I think you absolutely do it by owning both sides as the last thing I would expect now is a dullish, sideways market…And I am not being wishy-washy (you know I never am) but if you so desire, the same strategies outlined above can be used in reverse fashion (2 puts and 1 call) with the assumption that if you are Short, and wrong, you are going to be VERY wrong as the weather causes the markets to scream higher, thereby meaning you would have a strong chance to recoup everything through the increasing value of your “insurance” call option…Also, beyond being net long or short, I honestly think this is a situation in which simply owning units of 1 call and 1 put probably could pay off…Your profit objective would probably be smaller but if you run the math (which is what this is really all about anyway), and suppose that, minimally, we’ll see $1.00-$1.50 up or down in Soybeans, and 75 cents to a $1 in Corn, owning some of the options listed above, on a 1 to 1 basis, also looks promising. In fact, though no one EVER uses the strategy…What also makes a ton of sense here is to establish two totally independent positions, one Long AND one Short, using the 2 &1 approach on both sides. Each position is then handled independently of the other…Without going into great detail, whichever way the market goes, when the position that is the “wrong” way reaches the point where you can recoup 100% of what was invested on that side, you take it…and handle what would then be the winning side as though it was the only position you ever had…Perhaps that’s a bit confusing, but with my premise that these markets ARE going one way or the other. We’ll see. If you have any intention of doing anything with this, I’d say it needs to be done at current levels. Like I said, you’re either “in” this…or not. Besides that, lots of ways to anything I have suggested here…Give me a call if you want to know more.